1. Homeland Security appears to have grabbed a significant piece of turf in the Vancouver Airport that is properly titled as “You are Now Entering the United States of America.” Really? I thought the Vancouver International Airport was located in Canada. I couldn’t take a photo to document this as that’s forbidden. After all the usual checks we were allowed to go about our business in Canada. 2. As our molecules made their way south towards Dallas/Fort Worth, we note the rest of the family (Kari, Grayson Christine, Chris, Audrey, and Cathy) were making their way north out of Miami en route to Kamloops via Toronto and Calgary. They were just returning from a Caribbean Cruise but we could not time it so our molecules could meet. 3. Once in Miami, we were making our way out for a bite to eat along with several young people from Idaho when we were hit by a torrential downpour spurred on by several mini-tornadoes that hit Cuba and Southern Florida. 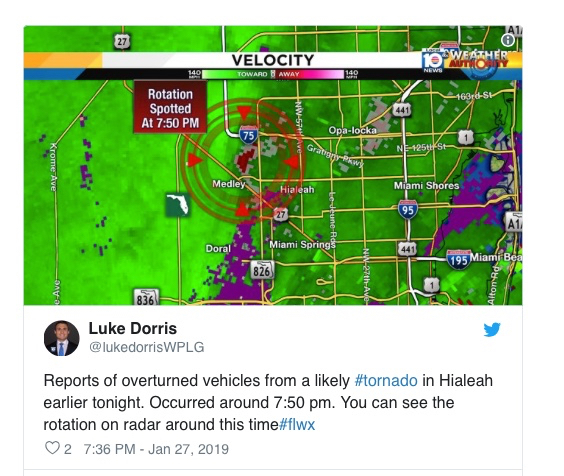 Another couple joining our molecular group, and who live in West Hialeah, had one of those mini tornadoes touch down only two blocks from their home (Miami Herald). The rain was so heavy over a 15 minute period, we were all drenched to the skin as we were making our way to a nearby Irish Times Pub. By the way, there was nothing Irish in the pub, but their beer and Gumbo was delicious. It is somewhat similar to Jambalaya, but the rice is not cooked in the same pan. Both originated in New Orleans in the 18th century. It was just hot enough to start drying our clothes from the inside. We managed to get back to the accelerator without finding another tornado. Can you just imagine the mess if that tornado had hit our molecules and mixed them up? 3. Our exit of the US was about the same as entering only this time the number of checks was doubled, sniffer dogs were circulating the security line and the occasional person (often more black than white – it’s not all that clear why) were singled out for a special check. Garth must have looked suspicious as he was also a marked man. 4. As we were about to depart someone appears to have mixed up our molecules as were here delayed for nearly two hours in a small segregation cubicle as they fixed a heating fan on the transporter. It was nice they left the movies running. 5. Once en route we head out over Cuba and central South America touching Columbia, Chile, Brazil and a few other countries along the route. After crossing the equator, we begin to slow for our approach to Buenos Aires. We also noted we have taken a large loop West somewhere over the Amazon, so there must have been some thunderstorm activity in the area. 6. 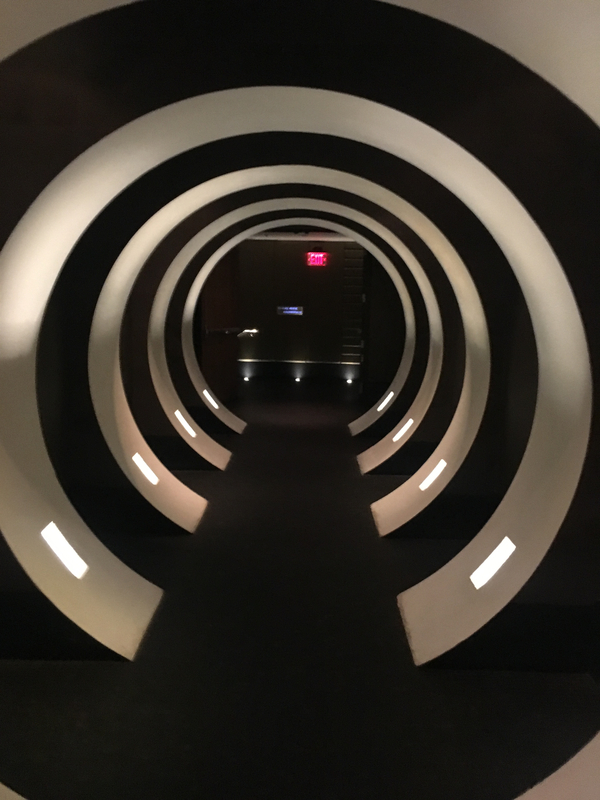 After landing and having our molecules reassembled, we were greeted by a minimal number of security checks and with a pat on the back and friendly smile, we were sent on our way. By the way, there was no sign of an UBER taxi at the airport as their system for renting and dispersing cabs seemed extremely efficient. As a final observation, when comparing the US and Argentinian airport security systems, it seems everyone in the US system appears to be afraid something might escape their notice so double down on everything. They somehow seem to have completely missed the fact that the greatest dangers in the US come from within and not from without. Harold, Lynn, Garth, and Esther.